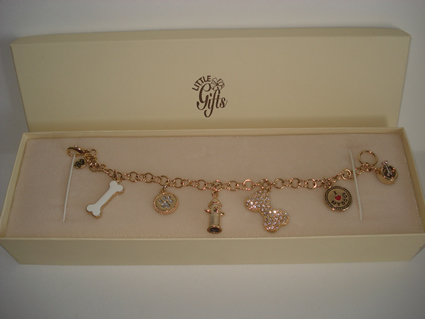 An exquisite handcrafted 14k gold-plated Dog Lover charm bracelet with gorgeous Austrian crystal bone. Bracelet measures 8" long. Gold plated, fine quality and detailing. Shipped in padded Little Gifts jewelry box.